The Donations project consists on two different educational videogames, developed by Blanca Borro Escribano, in which the players acquire the role of a hospital transplant coordinator or a national transplant coordinator. The objective of this project is to improve the systematization of complex medical procedures with implicit knowledge. The main educational purpose is to introduce the general concepts of the Process of Deceased Donation to healthcare students. First videogame represents the three processes managed by the Spanish National Transplant Organization representing the supra hospitalary level of the Process of deceased donation. It is comprised by three different parts, the donor’s evaluation, the distribution of the organs and the logistics of transportation. Second videogame represents the process of the donor’s evaluation but from the point of view of a hospital coordinator. The hospital coordinator has to evaluate successfully a potential donor and determine whether each of the organs is suitable for donation or not. With first simulation, the ‘ONT simulation’, the ONT has enhanced its training strategy. We believe, based on the feedback reported by ONT experts and on the student’s opinions, that students understand better the ONT procedure as they “get into context” from the moment that they start playing. This game-like simulations support effective decision-making. The student must analyze the available information, decide the best action and execute it in the game-like simulation. 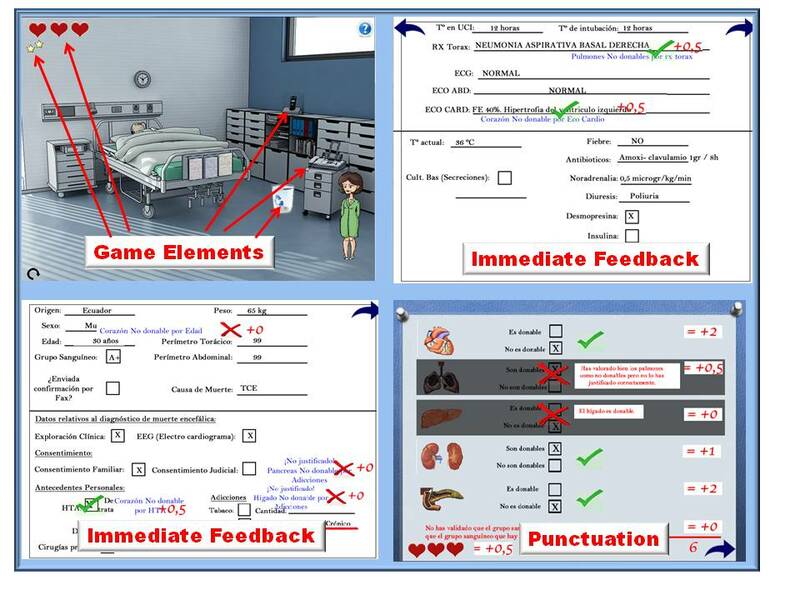 This game-like simulations guide the student in discovering all of the available information that is needed to make decisions and advance in the execution of the procedure.